Liquid: Good for this look because it goes on smooth, even with clean edges. Felt Tip: Easier to use, but can sometimes bleed or not be dark enough. Hard Tip: Can be harder to use because there is no give, but tends to be darker. Especially if waterproof. But it can get stuck in your eyelashes and cause clumping when trying to apply mascara. But stays on well. 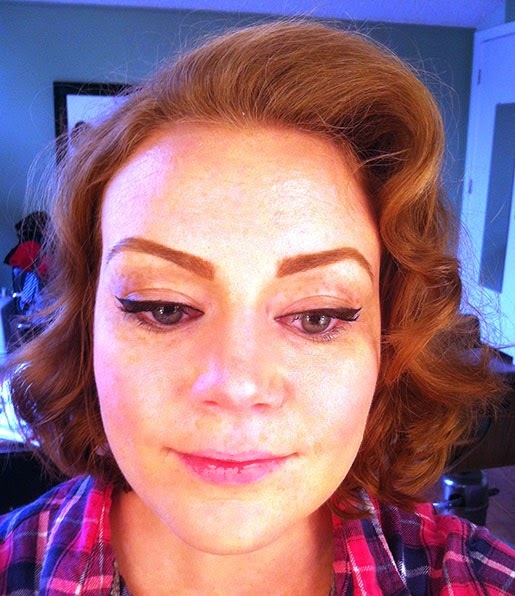 Pencil: Not very good for a cat eye as you can't get the small flick on the end very well. It is easier to apply because it's not as messy. Better for a smokey eye because it can be smudged and blended. Cream: This is what I use because I prefer to use a small brush. It gives me more control and goes on even and dark. Can transfer to the lid if you have oily eyelids. 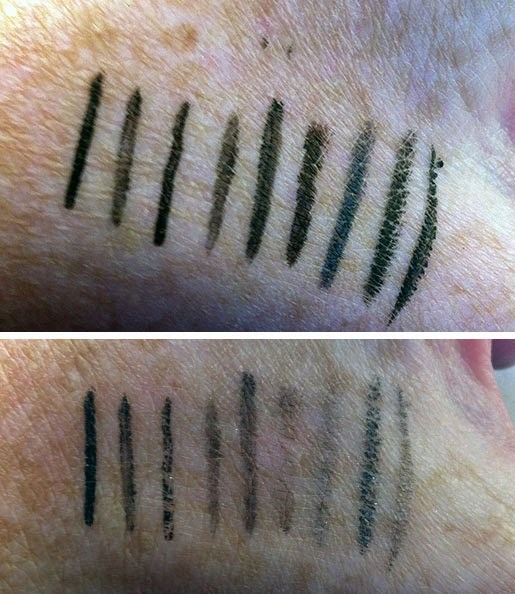 You can see the different shades and staying power of the eyeliners above. The bottom photo is after wiping my hand with a towel. The one that stayed is the waterproof liquid with the hard tip. I still prefer the cream because, while the liquid one stays, it gets stuck in my eyelashes. 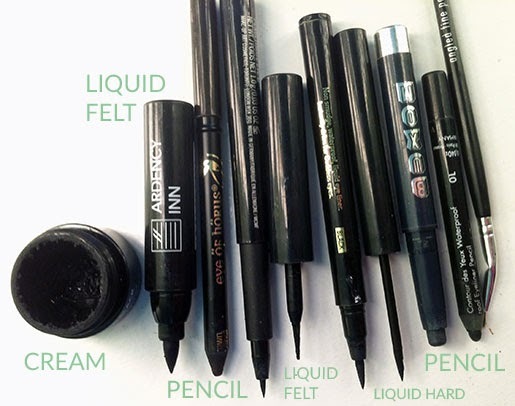 Here are the eyeliner brushes that I have. 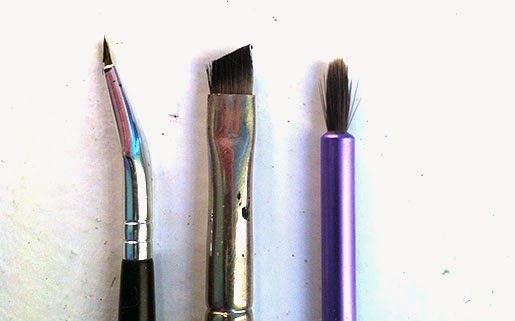 The first one is my preferred brush. It's very small and allows for more control. The angles brush is good for the flick on the end. Here is a video of how I apply my eyeliner with cream liner and a small brush. If you need a little extra help there is a trick you can use to make the flick even and straight, scotch tape. Place a small piece of tape as shown in the photo. 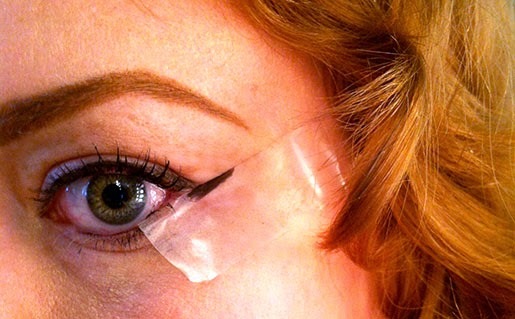 Here is a demo of how you apply the flick with scotch tape. 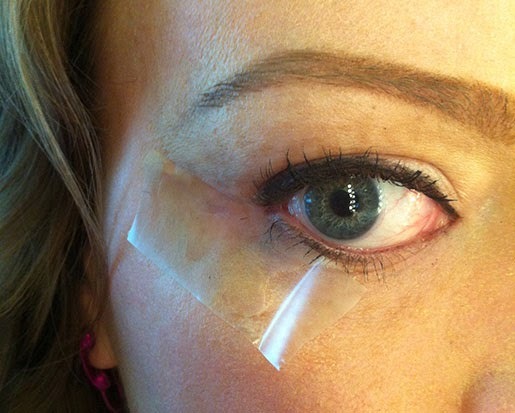 Pull the tape off slowly to protect your skin. And to get both sides even, just flip your tape over and use the eyeliner residue from the last application as a guide for where to stop. Here is the final result. It doesn't have to be perfect and it takes some practice. Don't be afraid to just wipe it off and start again. It's just makeup and it's supposed to be fun. Get crazy with it too. Play with how far you can take the wing and how thick you can make it. There is no wrong way to do it.